Facebook always gives prior concerns to the uses security, and regarding this Facebook introduce a another security level to login on users accounts. Facebook introduce login via "Security Key" feature that allows users to login their accounts with a physical USB device. As users use Two-factor-authentication features to tighten the security of their accounts, now with Security Key you can have a another level of security checkpoint on your account. Users can enable the Security Key feature from Security menu under Users Settings menu. Security keys can be purchased through companies like Yubico, and the keys support the open Universal 2nd Factor (U2F) standard hosted by the FIDO Alliance. Phishing protection: Your login is practically immune to phishing because you don't have to enter a code yourself and the hardware provides cryptographic proof that it's in your machine. 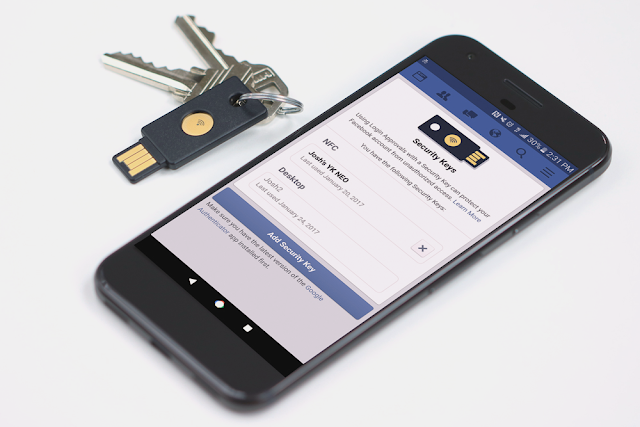 Interoperable: Security keys that support U2F don't just work for Facebook accounts. You can use the same key for any supported online account (e.g. Google, Dropbox, GitHub, Salesforce), and those accounts can stay safe because the key doesn't retain any records of where it is used. Fast and Secure Login: If you use a security key with your desktop computer, logging in is as simple as a tap on the key after your enter your password. Security keys for Facebook logins currently only work with certain web browsers and mobile devices, so we'll ask you to also register an additional login approval method, such as your mobile phone or Code Generator.To add a security key from your computer, you'll need to be using the latest version of Chrome or Opera. At this time we don't support security key logins for our mobile Facebook app, but if you have an NFC-capable Android device with the latest version of Chrome and Google Authenticator installed, you can use an NFC-capable key to log in from our mobile website.